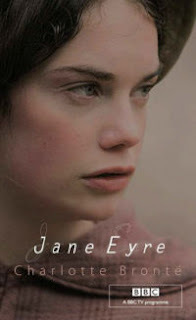 I loved, loved, loved, LOVED this adaptation of Jane Eyre. Can't say it enough. This 2006 Masterpiece Theatre version stars Ruth Wilson as Jane and Toby Stephens as Edward Rochester. Originally, a mini-series on the BBC, it was recently released here in Canada on DVD. Jane Eyre is a poor girl neglected and abused by her Aunt Reed who sends her to the Lowood School for girls. Here Jane must survive cold and starvation. She makes the most of her education and becomes a teacher at the school. Jane longs for more, however. She wishes to be a free, independent woman. To accomplish this she advertises for a position as a governess. She gains employment as governess to Adele, ward of Edward Rochester of Thornfield Hall. At first, she is quite satisfied with her position. It is all that she could have hoped for, Adele is charming and the housekeeper, Mrs Fairfax, a warm and caring friend. Then the long absent Master returns and challenges Jane's idea of happiness. They fall passionately in love. Disaster befalls them, when a secret from Rochester's past is revealed. Jane finds herself again alone, only this time heartbroken, having known real love for such a brief time. I think I've seen just about every film version of Jane Eyre. Many of those versions leave out important parts of the plot or characters. Of course, they also didn't have 228 minutes to fit it all in. Toby Stephens played Mr Rochester's grumpy, tortured character to perfection. Ruth, a little too pretty for Jane, was excellent as the innocent and moral girl. Even though Jane is a 'good girl,' her passion for her boss is apparent. And the temptation is great. When Rochester begs her to stay, wooo-eeeee- she's a stronger girl than I! That was a hot interpretation and a nice touch. The chemistry between Wilson and Stephens was right on. If you're a Jane Eyre fan, I think you'd enjoy this film version. Oh, I must have this. I wasn't even aware that it was out. I love this adaptation. Finally I get Mr. Rochester! I'll have to buy this one. I liked this adaption too even if Tobey Stephens was a little too handsome for Rochester, he'll do. :] I absolutely agree with you, though I am commenting about an entry that was posted two years ago. I recently read the novel, and finding out that there was a recent adaptation of it, I had to watch it. It was SO good! The casting was genius, the acting superb, and chemistry STEAMING hot. Thanks for the post, I am so glad you like it as much as I do! Nacho- Thanks for finding my old post :) I'm glad you enjoyed it. I still watch it occasionally. forever- I'm so glad people are still reading my thoughts on this!